Moving on to create two more developed and composed samples of stitching into paper. I firstly decided to take the layered tissue paper. I liked the way the creases in the layers looked like movement and I was considering the drawings of the leaves and how I could make a textural piece portraying the movement of leaves blowing in the wind. First I created a new base to stich into I used tracing paper as a backing then layered tissue paper I then sandwiched some rough twine and layered with more tissue paper this gave me a nice rough quality that looked like a tree swaying in the wind. I then stitched leaf shapes in various ways to make them look like they had blown from the tree. I was going to stitch lots more below the tree but this would have been too time consuming so I stitched in a piece of paper gauze making shapes to give the impression of a pile of leaves. I was quite pleased with the way this worked out however it is a slight digression away from the brief to use our original drawings. This was more an idea that built up from the drawings through the process of the paper manipulation and onto the stitching. My second piece was further to my previous interest in the dress detail. I wanted to create a geometric design with floral shapes intertwined. 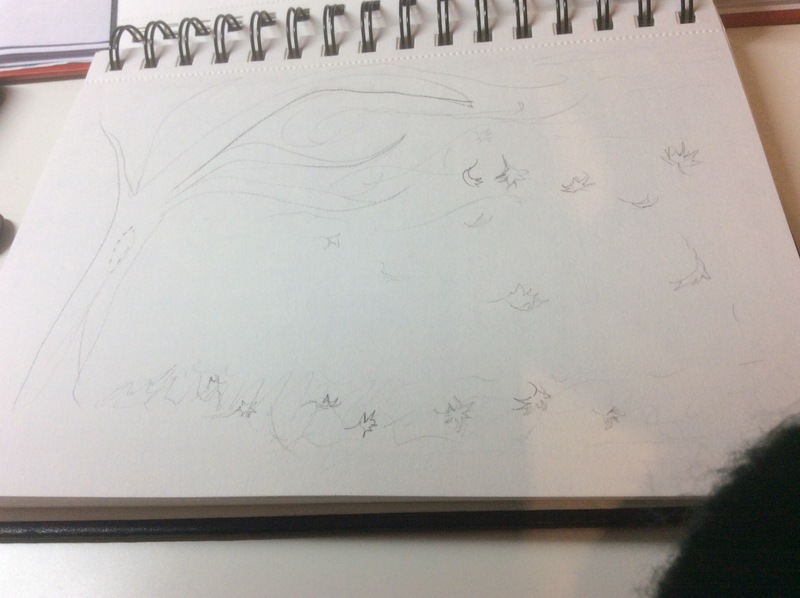 I drafted a rough design in my sketchbook and then proceeded to choose the sample of layered kitchen paper which was very lightly patterned already. I used some of these markings to pick out and pierce through before stitching the floral shapes. I used a thin long stitch to make a hexagonal honeycomb design. I decided to keep this design black and white which brought focus to the stitch and pattern. I was fairly happy with the result however the amount of stitching detail is not quite balanced and could either do with less or more. If more of the white space was filled with a variety of florals or it was scaled back to include just one central floral shape. I think it would have been interesting to add an insect shape but I didn’t consider this at the time.